What do I know of hate? A ricochet fire-crack splits the night streets. The sound chills my soul. I have never fired a gun but the media have taught me this sound and I recognise its tyranny. It is synthesized in my knowing as the sound of terror. The distinctive stutter of mechanical death. During the seventies I worked in central London. In 1978 a car exploded immediately outside my place of work. After the rancid bellow of explosion I stood with my colleagues in a vacuum of silence. The window of our office had become a gaping hole and a cold December chill was biting my face. Within minutes an army of police arrived. They cordoned off our road. Dover Street, the heart of Mayfair, where things like this should never happen. We were told to go home. Gianni pointed from the sandwich shop across the road. I looked up to see a helicopter hovering above our building. The police had found body-parts on the roof. The event was barely mentioned in the news – nobody died except the perpetrators. Later we learned the men who died were delivering the bomb to a destination never discovered, or revealed. The London papers reported they were Iranians but quickly fell silent as another story, another crisis, grabbed the public’s gaze. I was angry my comfortable world had been invaded by somebody else’s war. 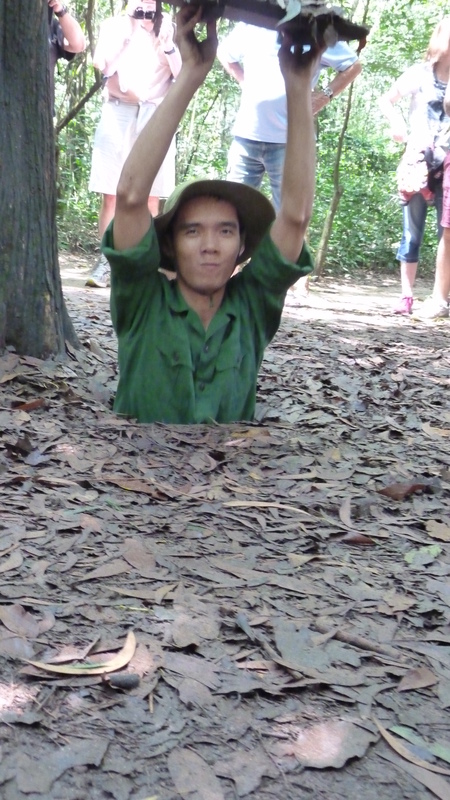 Last month we visited, as tourists, the place which most represented war during my childhood – the Chu Chi tunnels in Vietnam. As we followed our guide Michael through the maze of jungle paths he explained how the ‘communist rebels’ survived in these inhospitable conditions for twenty years. His father had died fighting on the ‘other’ side, for the South. He described without emotion how his mother was forced to abandon him and his brother to a Catholic orphanage. He said the priests had made him a scholar. He was proud of his country – ‘we look forward, never back’. During our tour the sound of Kalashnikov gunfire echoed above our heads. The sound was unnerving, adding a distinctive edge to our visit, but we never felt afraid. Michael led us finally to the firing range, a small clearing squeezed behind the café and gift shop. For the price of a bullet, anyone could have a go with a gun – no rules, just pay the man and he’ll load the gun with live ammunition. It’s an easy gun to shoot, Michael said. I don’t know why some people decide that the only way to change what is wrong with the world is by murdering the innocent, I do not comprehend that level of hate because my life has been entirely gentle and safe. War is down to politics but I do not know how to fight hate except by loving more. I have to believe we can make the world better. every time, for someone else’s action/ error they punish the innocent people. And sometimes I wonder, do even any govt say the truth to their people ? we are living a difficult time …very unstable time .. So true greyeye, all free-thinking people must condemn the fighting of wars by use of terrorism. We are able to communicate across the world in milli-seconds yet we cannot stop these few fanatics who seek to destroy harmony. The shame is that we become more wary of strangers when we should be uniting to make the world safer. I believe we must strive for a peaceful solution. War is never the answer.